This is a pair of 1950s unfinished corded cushion covers in vivid pink sateen, plus accompanying patterns, booklet and woollen cord. The covers were rescued from the Oxfam shop in Llanidloes in 2003. The items were originally bought from G Jones Dressmaking Shop of Aberystwyth, Ceredigion, Mid Wales.The fabrics for the backs, zips and threads are all included. 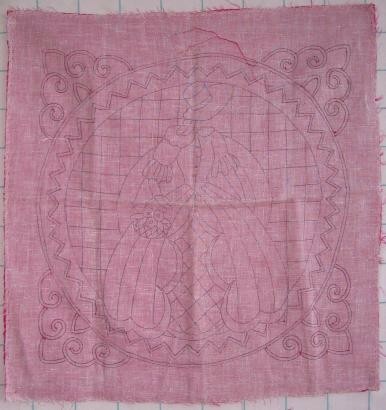 The cover fabric is a vivid pink cotton sateen overlaying a muslin foundation fabric. On one cover, featuring a trellis design with a Japanese woman, the cording quilting is finished, but the cushion has not been made up. The second cover has had a design of a crinoline lady drawn on, but no cord has been threaded through. It is stitched in four corners only. The booklet is “Quilted Cushions” and cost 1/6d at the time. It features commercially printed patterns.